When the stadium lights came on for the very first time at Bristol Motor Speedway on the evening of August 26, 1978 to illuminate the Volunteer 500 NASCAR Cup Series race, no one knew at the time that it was the beginning of something truly special. Prior to that, only one other track had hosted NASCAR Cup races at night: the Nashville Fairgounds Speedway. Fans at The World's Fastest Half-Mile have loved the energy and atmosphere created at every edition of America's Night Race since, and simply love watching their favorite sport under darkness in the cool crisp evening air. The race cars sparkle and shine and history has shown that sparks will fly and sometimes tempers will flare as 40 drivers are aggressively running their race cars on the .533-mile all-concrete high-banked oval, beating and banging for track position. The Bass Pro Shops NRA Night Race, set for Aug. 18, marks the 40th anniversary of racing under the lights at The Last Great Colosseum. "We are proud to celebrate 40 years of racing under the lights at Bristol Motor Speedway," said Jerry Caldwell, BMS executive vice president and general manager. "The Bass Pro Shops NRA Night Race, or America's Night Race as many have come to call it, continues to be one of the most exciting and most anticipated events for fans on the NASCAR circuit. There have been so many memorable finishes during the race over the years, it never seems to disappoint in terms of action and intensity." Cale Yarborough raced to victory at the very first BMS Night Race. He drove his No. 11 Oldsmobile to the checkered flag after holding off Benny Parsons for the victory. Yarborough led 327 laps of the race, including the final 193. He beat Parsons by 15 seconds. Since then there have been many memorable moments during America's Night Race. Just to name a few, fans remember vividly Tony Stewart's helmet throw in 2012, Ward Burton's anger towards Dale Earnhardt Jr. in 2002, Carl Edwards using the famous bump-n-run on Kyle Busch to get the win in 2008 and Kevin Harvick spinning out Denny Hamlin early in the 2014 race. However, there have been two America's Night Race finishes that really put the event on the map in the mid to late 1990s. In the first of two America's Night Race tussles between Terry Labonte and Dale Earnahardt Sr., Labonte got the better end of the outcome. 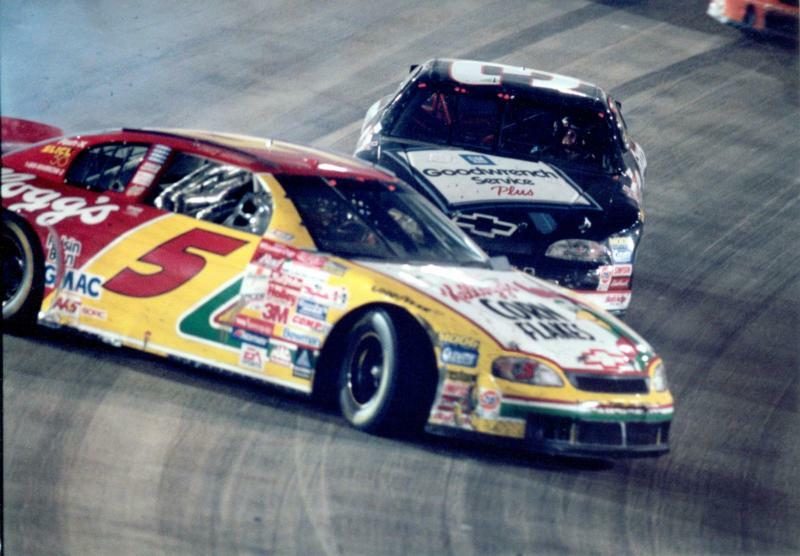 The two drivers were racing doorhandle-to-doorhandle in the event's closing laps, when Earnhardt's car ultimately made contact with the back of Labonte's car as the two sped to the finish. After the impact was made, Labonte's machine went sliding across the finish line as the checkered flag waved. The Victory Lane snapshot of Labonte and his crew standing beside his crumpled Chevrolet while it was steaming and spewing fluids remains one of the lasting images of America's Night Race. Four years later the legendary duo decided to add a sequel. This time Earnhardt got the better of Labonte in a similar bump and grind finish. This time the "Intimidator" sent Labonte's car sliding in turns three and four and sprinted past him in his black GM Goodwrench Chevy to take the checkered flag. In Victory Lane, Earnhardt famously said, "I didn't mean to turn him around, but I did want to rattle his cage." The winningest driver in Night Race history is Darrell Waltrip, who has claimed seven checkered flags in the event and remains the only driver in NASCAR history to win the event in three consecutive years. As the 40th America's Night Race prepares to get underway, fans should expect more of the same drama and intensity that has defined the race over the past 39 editions. There are four races scheduled during three nights of racing at the Bass Pro Shops NRA Night Race weekend, including action in the Whelen Modified Tour, Camping World Truck Series, Xfinity Series and the Monster Energy Cup Series. During the Cup race, you'll get to see all of your favorite drivers doing what they do best, including Bristol dominator and defending winner Kyle Busch, his arch-rival Kyle Larson, rising star Ryan Blaney, 2016 Night Race winner Kevin Harvick, Daytona 500 winner Austin Dillon, defending series champ Martin Truex Jr., Chase Elliott, Erik Jones, Brad Keselowski, Denny Hamlin and Bubba Wallace.